The White Box is programed though a public project proposal process. Proposals are always taken into consideration but are reviewed two times a year. To apply, please reference the following information and the linked White Box Project Proposal Form and White Box Floor Plan PDFs. The University of Oregon Portland’s White Box is not currently seeking new project proposals at this time. The White Box is comprised of two spaces that can be programmed independently of one another. The White Box, rooms one and two, accommodate large-scale work and group shows (550sq ft each). The Gray Box (600 sq. ft.) is designed to accommodate film, digital projection, interactive installations, and experimental sound work, as light and sound can be controlled effectively. The space is also appropriate for intimate installations. The White Box provides professional and technical support for both spaces. Programming encourages curatorial and artistic experimentation. Architects, designers, artists, curators and organizations are encouraged to submit proposals for exhibition programming in the White Box. 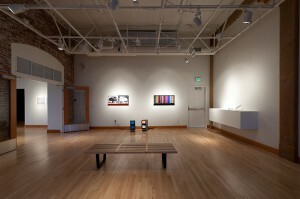 Preference will be given to original exhibitions, curated for the White Box spaces, exploring contemporary inquiry from unique perspectives, and demonstrating a relationship to Portland’s community and the academic mission of the University http://pdx.uoregon.edu. Project proposals are reviewed by the programming committee, which makes advisory recommendations for selection by the White Box Committee Chair in Portland. The White Box provides space, staffing, programming promotion, and limited insurance. Selected exhibitions are responsible for exhibition related expenses, including, but not limited to shipping, transit insurance, and exhibition preparation. White Box Mission: Through exhibitions and related educational and public programming, the White Box is dedicated to creating a laboratory for the exploration of contemporary creativity and critical inquiry. White Box programming aims to reflect and extend the intellectual work of the University, expressed via fine art, new media, installation, architecture and design, attracting diverse audiences with a range of specific interests. * For submission and further information, email whitebox@uoregon.edu, subject line: Exhibition Proposal_Applicant Last Name. * To see images of the White Box and Gray Box spaces including past exhibitions: Please see this gallery of images. The White Box provides graphic design support for exhibition promotional material including posters, eblasts, exhibition show maps and show information. The White Box also provides extensive online programming promotion including e-mail blasts, monthly newsletters, and promotion on White Box social media outlets Installation and de-installation support provided by White Box including staffing, hardware, fixtures, and fasteners. Any specialty hardware or fixtures are responsibility of exhibitor. A completed Project Budget will be required for all exhibitions. The White Box provides space, gallery staffing during open hours, programming promotion and limited insurance for collections. All exhibition related expenses and work installation are the responsibility of the exhibition proposer. This includes but is not limited to: shipping, transit insurance, paid promotion, reception catering, travel accommodations, printed media, and a 10% (of over-all budget) administrative fee. The White Box Coordinator and Advisory Committee will offer assistance in identifying potential financial resources.